Erik C. Peterson, a native of the upper Midwest, grew up in Fargo, ND. He attended college and worked in Minneapolis and St. Paul until moving to Indianapolis in 2005. 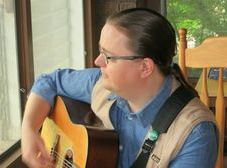 Erik studied violin and viola in his youth, but following the invention of the fret in the early 1990s, shifted his focus to things like the mandolin, banjo (tenor and 5-string), guitar, and ukulele. The rare staff member of IAAI without formal music training, he recently finished a Master of Arts in Public History, focusing on the music and popular culture of Indiana at the turn of the 19th century. While in the Twin Cities, Erik helped found the Twin Cities-based contra dance band Pig's Eye Landing and played a variety of instruments for the Wild Goose Chase Cloggers - both of which took him on various tours of the U.S. and Europe. He currently plays and sings with the Indiana Old-Time Ambassadors and Hogeye Navvy.